Jogger in Oakland, California throws homeless man’s belongings into lake, trash can. 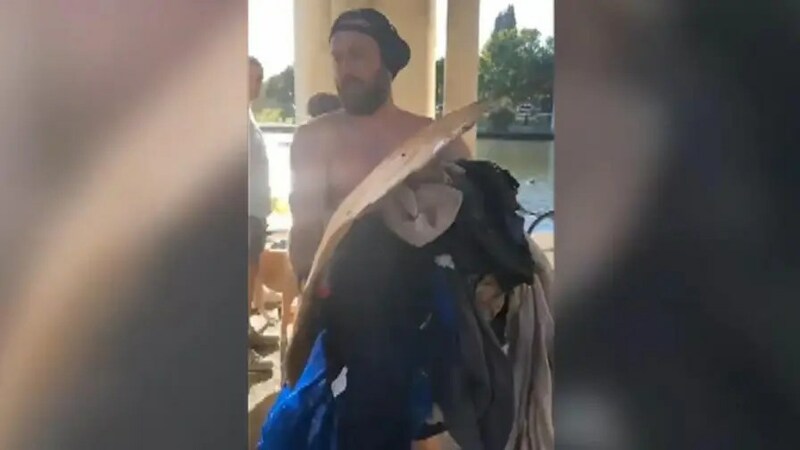 A video that captured a jogger in California throwing a homeless man’s belongings into a lake and into the garbage last week has caused outrage in the community. J.J. Harris posted the video to social media on Friday and it had garnered thousands of retweets and shares, according to FOX2. Harris said he found the jogger throwing the man’s things into Lake Merritt. The man, who was not identified, was confronted and bystanders asked him what he was doing. “Picking up the trash. What do want me to do? It was spilling everywhere,” the man responded. The video sparked outrage and debate on social media, according to the station. One Twitter user called out the jogger calling his actions “cruel,” while another said throwing the garbage into the lake was doing more harm than good for the environment. Another said that people shouldn’t have to go through “trash” while they jog or walk. The jogger left the area before police arrived on the scene, Harris said. A GoFundMe was started to help the man, who was identified as Drew. “Like the thousands of other people in the Bay Area without homes, Drew is one of our neighbors. We’re disgusted that someone thought it was ok to treat Drew this way and want to show him through our care that what happened to him is unacceptable,” Kenzie Smith wrote on the GoFundMe page. Oakland officials urge residents to call 311 to report debris or hazardous material.